When I first started blogging (back in August 2012) I made durian ice cream as I reminisced about eating it during my childhood years in Vietnam. It was my uncle who took my 2 brothers (Dân, aka Miến and Sơn, aka Sua) and me on his 100 cc motorcycle to a nearby city (Sóc Trăng), located about 3 miles from our small village in Ngã Ba An Trạch for this special treat. Of course back then none of us wore helmets or fell off the bike (at least not to my knowledge). Perhaps it was pure luck that we all survived such trips. As children when we were told by a grown up to hang on we hung on! One of my brothers, usually Sua gets to sit in front of my uncle. While the two older (Miến and I) were on the back. Recently I took a bus to Boston (South Station) to see my husband who was there for several meetings. Going to see my husband means I had to walk through Chinatown. I stopped into one of my favorite sandwich (bánh mì) shops called Mei Sum (located at 26 Beach Street, Boston, MA). Usually 2-3 women run the front end dealing with customers. These friendly women speak Cantonese, Vietnamese, and English. One of them can speak Teochew (another Chinese dialect that I passively know). There are a few tables and chairs for customers to sit. Most of these customers are elderly Chinese men socializing with each other while sipping coffee or tea. Visiting this shop always reminds me of my late grandfather and his friends enjoying the same activity every morning at their local coffee shop (in Vietnam). This place sells excellent bánh mì, shrimp or beef rice rolls in small styrofoam containers, cakes, pastries, dumplings, coffee and tea. A few years ago I learned that they sell prepared frozen seedless durian by the pound. One of the ladies proudly informed me that they use the same durian to make their cakes. If you like what some people called the king of all fruit or stinky fruit then you may want to try their delicious durian cake! For any special cakes you may want to call ahead and put in an order. I have been shopping here for years. When they saw me this time they quickly informed me that my husband was in earlier to buy some bánh mì (which I already knew). However, they did not think he bought their fresh rice rolls so I bought a box of the shrimp and a frozen durian package. 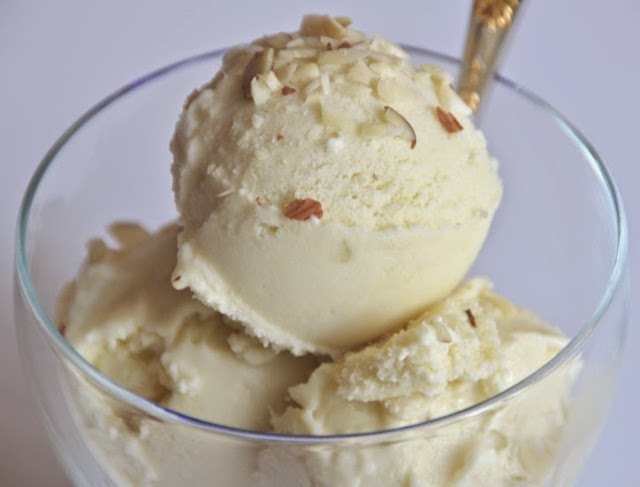 In the past I made durian ice cream using heavy cream. This time I replaced dairy for coconut milk for anyone who may be lactose intolerant or may not have access to heavy cream. This non-dairy durian ice cream tastes almost the same as the one that I made using heavy cream. It helps that the durian fruit is creamy in texture. This time I used less sugar (1/3 cup vs 1/2 cup). I like to add crushed roasted nuts on top similar to how it is served in Vietnam. I don't get too excited by ice cream in particular but I eat this despite it being completely firmed. I quickly took a few photographs as my husband commented, "I can smell it, it's very strong." Yet, he ate half of my prop. I guess it was not that bad after all! 1) In a blender, puree durian and about 1 cup of coconut milk together until well blended. 2) Put the rest of coconut milk in a medium size pot over medium high heat. Once the liquid starts to bubble turn heat down slightly to a simmer, stir occasionally for about 4-5 minutes. 3) In a bowl whisk eggs and sugar, and tempering this with some of the hot liquid (do not scramble the eggs). 4) Pour the pureed durian into the pot and cook, stir occasionally for about 4-5 minutes. Add the tempered egg and sugar. Turn off heat and let everything cool completely. Refrigerate the contents until chilled. 5) Stir the chilled item together and process in your ice cream maker for 30 minutes or according to your manufacturer's instruction. 6) Pour the ice cream into a container and put in the freezer for at least 4-6 hours until firm or overnight.